Asserting that development has to result in jobs, PM Narendra Modi said the government will change rules, reform tax system and target subsidies to the needy. Prime Minister Narendra Modi on Friday promised reforms "at top speed" with positive regulatory framework, tax stability and boost to infrastructure to help take the economy to $20 trillion from $2 trillion. Asserting that development has to result in jobs, Modi said the government will change rules, reform tax system and target subsidies to the needy. "A positive regulatory framework, tax stability and ease of doing business are being pushed ahead at top speed... We are cutting down on multiple clearances that choke investment. Our complex tax system is crying for reform which we have initiated. I believe in speed, I will push through change at a fast pace. You will appreciate this in times to come," he said addressing Economic Times Global Business Summit in New Delhi. Maintaining that improvement in governance is a continuous process, Modi said government was making changes wherever as rules and procedures were not in tune with the needs. After two back-to-back years of below 5 per cent growth, governance at rock-bottom and a series of scam, the transition of the New Age India has begun, he said. "We have to repair the damage that has happened. Restoring growth momentum will be an uphill task. It will take hard work, sustained commitment and strong administrative action. But we can overcome the mood of despair," he said. Stating that transparency and efficiency in governance and institutional reforms are essential elements for rapid growth, he said the government was "moving fast in designing policies and laws to promote growth". Infrastructure, he said, is being given a boost and "new approaches and instruments are being put in place" to attract greater investment in sectors like railways and roads. Outlining his agenda, Modi said fiscal deficit targets will not be breached, inflation will be controlled through firm measures, GST will be implemented and schemes like Jan Dhan Yojana will be pursued to get poor included in the financial system and the rupee will be made more productive. 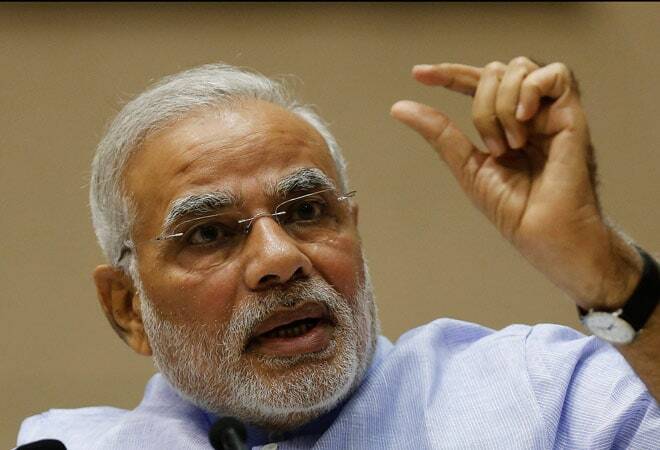 Modi said there was no contradiction between doing big ticket items and doing small things. A massive national programme for computerisation of public distribution system (PDS), right from FCI godwons to ration shops and consumers, will be launched, he said, adding subsidises are needed for poor and there was a need to cut subsidy leakages. Stating that the cash subsidy transfer to users of cooking gas (LPG) was the world's largest cash transfer programme, he said, "we plant to introduce direct cash transfers in other benefit schemes." "We are committed to achieving the fiscal deficit target announced in the Budget. We have worked systematically in this direction," he said, adding cutting wasteful expenditure would help achieve the target.